On Friday 4th December a public meeting was held at the School of Oriental & African Studies in London with a number of speakers including Ronni Kassrills a Jewish ex-ANC-Cabinet Minister in South Africa and Bongani Masuku of the Congress of South African Trade Unions. All told, 2 of the 4 speakers on the platform, to say nothing of the audience were Jewish (Prof. Stephen Rose was the other one). Not bad for an 'anti-semitic' meeting!! 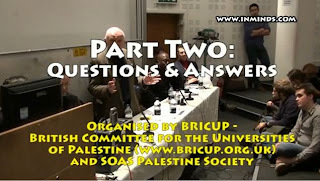 The meeting was organised by Bricup, the main organisation campaigning for an academic boycott. About 300 were in the audience. After about 4½ minutes into the question and answer session, a well-known figure, Jonathan Hoffman, got up to speak. The thrust of his comments were that Bongani Masuku was a racist, guilty of ‘hate speech’ (i.e. had offended white liberals in South Africa and white reactionaries outside it). Now Jonathan Hoffman is Co-Chair of the Zionist Federation. He is well known for his disruptive interventions at anti-Zionist and pro-Palestinian meetings. He has been bitterly criticised even by the Vice President of the Board of Deputies of British Jews, no slouch when it comes to supporting Israel, Jerry Lewis, for what are seen as his counter-productive tactics. So when Hoffman began his speech, there was instant name recognition and lots of boos and hisses, until the Chair Tom Hickey quietened people down. It is worth nothing that Hoffman wasn’t attacked physically, he wasn’t insulted and was allowed to make his point. Maybe Hoffman would have something to complain about if he had been kicked and punched, but no, there was no such Zionist behaviour. Note that the Zionist Communist Security Trust, which uses false allegations of ‘anti-Semitism’ to obtain funds to pay its lavish salaries, including a 5 figure sum for its Director Mark Gardener, has not had anything to say about this untoward violence! But the BBC decided to run with a Zionist press release and the puerile outpourings of Raheem Kassam of the Tory Student Rights Conservative Future, laughably described as an ‘anti-racist’ activist. Their allegations were that the word ‘Jew’ or ‘Jewish’ were shouted as soon as Hoffman began speaking. The problem is that this is a lie. The Jewish Chronicle even posts the Youtube video on its site. Yet I have listened 5 times when Hoffman begins to speak and although there is shouting and disagreement there is no shout of 'Jewish' that I can hear. It is simply a figment of the imagination. In short this is a deliberate post-hoc lie thought up by a rancid young Tory and adopted by Hoffman and co. Unfortunately for them, the video that is posted proves the complete opposite! Hoffman alleges that the 'Jewish' chant was directly after he asked why he was being interrupted. In fact the only discernible comment is 'do you really want to know?' as well as a mixture of boos. In other words, this is entirely made up. It is absolutely clear that the antagonism towards Hoffman is entirely because of his reputation and his absurd attack on a respect anti-racist who represents one of the main organisations which helped overthrow Apartheid, at a time when Israel was up to its neck in supplying White South Africa with arms and military training. ‘Footage has emerged of a man being told he is "not welcome" after revealing his Jewish name at a School of Oriental and African Studies debate on Palestine. The film shows Jonathan Hoffman ask why Soas university allowed a man condemned as an anti-Semite by the South African Human Rights Commission (SAHR) to talk. Upon revealing his name there are boos and shouts of "Jewish!" Anti-racism campaigners called it "chilling". A spokesman for the London university said nobody broke hate speech rules. The event, entitled The Case for Sanctions and Boycott [of the nation of Israel] was organised by the School of Oriental and African Studies' [Soas] Palestinian Society. They invited South African trade unionist Bongani Masuku to speak. The SAHR has condemned Mr Masuku for "hate speech", saying his comments "are of an extreme nature that imply the Jewish community are to be despised, scorned and ridiculed". The film, posted on YouTube, shows Mr Hoffman ask: "Why does the University and College Union (UCU) invite somebody who practises hate speech?" Once boos have subsided the chairman of the debate, Tom Hickey, of the UCU, directs the speakers to "ignore" the question. Mr Hoffman has described himself as "cross" after the "anti-Semitic" meeting. The name Hoffman is of German-Jewish origin. "The overpowering racist jeering as displayed by some audience members at the event is a stark and chilling revelation of what can happen when extremism is allowed to take root in universities. "This man was first shouted down, then ignored by the event chair and panellists. "Why? From what we hear shouted when he is speaking, because he is, 'Jewish', and 'not welcome here'." A Soas University spokesman said: "Soas has strict guidelines against hate speech and incitement to violence at public events. "Event chairs are authorised to stop proceedings if any speaker or audience member breaks the law or engages in speech or behaviour that violates that policy." He added: "From what is shown in the clip in question, that appears not to have been the case at this event." The spokesman refused to say whether the university condoned the appearance of Mr Masuku. Mr Hoffman and the university's Palestinian Society were unavailable for comment. Mr Masuku categorically denies accusations of racism. In fact many of the audience were Jewish, as well as 2 of the speakers. Jewish anti-Zionists don't tolerate anti-Semitism or indeed any form of racism - which is why we oppose Zionism so vehemently. But unlike Hoffman we are also anti-racist. The jeering was on account of Hoffman’s politics not his religious affilations. Needless to say that the BBC, fresh from a year of pro-Zionist reporting, including its disgraceful decision to openly support Israel’s bombardment of Gaza and refusal to carry the Disaster Emergency Committee's Appeal for Gaza earlier in the year, including the idiot decision of its Trustees to criticise the normally pro-Zionist Jeremy Bowen for having referred to the settlements on the West Bank as illegal, found that it was caught bang to rights. All the allegations above could be disproved by listening to the video where, as I stress, there was no mention even of the word ‘Jewish’. This is not surprising as I have been in the Palestine solidarity movement 30 years and with the exception of Gilad Atzmon and his supporters, who have worked closely with Zionists like Mike Ezra and Paul Bogdanor, I have never experienced anti-Semitism. If sometimes people are confused about the differences between anti-Zionism and anti-Semitism that is because the Zionists do their best to sow such confusion. A row has broken out over a meeting about Israel at a University of London college that one man described as "anti-Semitic". Jonathan Hoffman, vice-chairman of the Zionist Federation of Great Britain, made the claim in a blog relating to a meeting at the School of Oriental and African Studies. But others have insisted the meeting was fair and there were no anti-Semitic undertones. Other Jewish audience members spoke without being heckled. Mike Cushman, who was part of the audience, said: "It was an extremely serious and positive meeting. "The jeering was directed at Jonathan Hoffman because of his individual beliefs, not because of his religion. "It is worth noting many of the audience were of Jewish origin." Also in the audience was Naomi Wimborne Idressi. She said: "I am a Jew and I am very sensitive about anti-Semitism. There was no anti-Semitism at the meeting. "It was a meeting which was fervent about human rights. There was a lot of learned discussion." Mr Hoffman had criticised the appearance of South African trade unionist Bongani Masuku, who has been condemned for hate speech by the South African Human Rights Commission. In a blog, he described the event as an "anti-Semitic meeting" and wrote: "There were many anti-Semitic statements about Israel as an apartheid state." After viewing the footage of the meeting, which has been published on the internet, Raheem Kassam, of campaigners Student Rights, said the response to his question constituted racist jeering. But Ms Wimborne Idressi said he was booed because he is a high-profile Zionist, well known for controversial views on the Palestinian territories. A Soas spokesman said: "Soas has strict guidelines against hate speech and incitement to violence at public events. "Event chairs are authorised to stop proceedings if any speaker or audience member breaks the law or engages in speech or behaviour that violates that policy. "From what is shown in the clip in question, that appears not to have been the case at this event." Thank you for your feedback to BBC News Online. The background to the story about which you have complained is that the meeting at SOAS was highlighted to one of our journalists who was sent a video of the "incident", which was also reported on Mr Hoffman's blog. The journalist contacted the Board of Deputies of British Jews who confirmed that they were aware of what had happened…indeed there had been a report in the Jewish Chronicle. 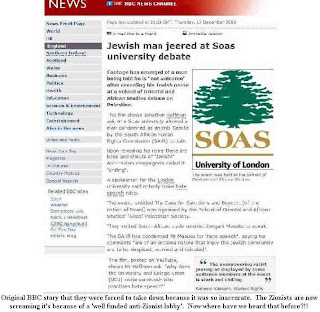 He also contacted the Zionist Federation and SOAS for comments. The SOAS press office confirmed that they were aware of the allegations of what had happened in the meeting. The reporter also contact the SOAS Palestine Society, informing them of the accusations and emailing them links to Mr Hoffman's blog and the video. The society told the reporter they could not comment. After publication it quickly became clear that there was more to what had happened in the meeting than was apparent from the video and Mr Hoffman's allegations. As soon as that became clear the story was amended to reflect the differing views of those who had been at the meeting. It is regrettable that the original story did not reflect a wider range of views and the journalist concerned has been made well aware of the requirement to do so in the future. Actually strictly speaking this is quite correct! The audience did make it known that he was not welcome after revealing his name, which could be taken for a Jewish name (if there is such a thing). But it wasn’t because of his name that he was jeered, so if you are a semantic lawyer, you might indeed have a case! Zionist Community Security Organisation Is Concerned Though! 'CST spokesman Mark Gardner said: “Mr Hoffman merely repeated what the South African Human Rights Commission had said about Bongani Masuku’s alleged incitement of antisemitism. For daring to raise this he was jeered with outright hatred. So Gardner, who wasn't at the meeting, is happy to accept that there was an anti-Semitic incident even though the 'victim' was himself not aware of such until over 2 weeks after the alleged anti-semitism. But then the CST has to pay its spokesperson Mark Gardener and several others a 5 figure salary. Hence its eagerness to highlight anything which is 'anti-Semitic' when it's to do with Israel. That is why we say its statistics are meaningless, contrived and self-serving. I covered this before the article was changed as did Lenin at the Tomb. I complained to the Beeb at the time as well but I haven't received a reply yet. I had completed a post about the sheer dishonesty of the first version on the BBC website and teletext when a comment to it pointed out that the beeb had changed the whole article. Of course the libel was still viewable by all web users for almost a day and I don't know if the teletext ever got corrected. It is worth noting that Raheem Kassam's website contains a screen shot of the original BBC article to give the misleading impression that this is how the BBC still views the meeting. This is despite his main page on the meeting showing he updated his account on 18 December, the day after the BBC removed the worst inaccuracies from their report. Don't be so stupid. I was trying so hard to make myself heard amidst all the deranged shouting that I did not hear the antisemitic chanting. Only when I listened to the soundtrack did I hear it. You of course are selectively deaf to it. Jonathan Hoffman argues that amidst all the 'deranged' shouting he didn't hear the 'anti-semitic chanting'. Are you being serious Jonathan? Someone who is as sensitive as you to 'anti-semitism'? There was not just a shout, but 'chanting' - Jew/Jewishness/Jews Out etc. - but you didn't hear it? And then you accuse me of being 'selectively deaf'. Perhaps the reason I still can't hear anything, after having listened at least 10 times to it, is that it isn't apparent. You are engaged in wishful thinking. You would have liked there to be anti-semitic chanting, that I'll grant you. You are on record as saying that all anti-Zionism is anti-Semitic. The problem is that criticism of Zionism and Israel is not, in most peoples' minds anti-semitism. So, quite dishonestly, you have to resort to what is clearly a form of imagined fulfillment. Raheem has his own fish to fry but your motive is quite clear. There were a large no. of Jewish people in the audience. Unfortunately I could not be there but I know that people like Naomi would not tolerate anti-Semitic shouting and it is not something I have ever heard before at a pro-Palestinian/anti-Zionist meeting. Never. The BBC recanted because the evidence didn't stack up. It seems in your case that pride is getting in the way of honesty? Or maybe defence of the indefensible has made that a moot point also? After all, defence of a starvation siege and bombing a civilian population used to be things that the enemies of Jews were best at. Tony, given your stated opposition to antisemitism, what is your position on Gilad Atzmon. Listen to how hard I had to shout to make myself heard Tony. It is physically impossible to listen as well when one is doing that. Try it. It is physically impossible to shout and listen at the same time. 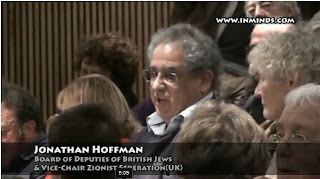 I see that Hoffman, like the Board of Deputies, finds himself such an embarrassment that he is now going anonymous! Hoffman, there were self-identified Jews that spoke before and after you and neither got booed before it turned out that they were speaking for the Palestinian cause and not against it. You are well known as a trouble maker and an uncritical supporter of the racist war criminals of the State of Israel. You even lie about the provisions of the 4th Geneva Convention. That is why you were jeered and none of the other Jews were. Even some of the faithful at Harry's Place aren't claiming to have heard what it took you two weeks to claim to have heard. The worst they have come up with was how terrible it was that you weren't allowed to change the subject from non-violent strategies against the last of the colonial settler states to a question about one of the panellists. Anyway, carry on with your complaint to the police and the CST. You'll be wasting police time, exposing the CST's dishonesty and you will merely serve to expose the BBC's originally outrageous bias in favour of the supporters of racist war criminals. BTE - whose idea was it to describe the complainants to the BBC as a well-resourced anti-zionist lobby? Do give it a rest, Jonathan. I was also at the meeting and did not hear any anti-semitic comments whatsoever, and indeed would be astonished if such comments were made in a gathering where there were Jewish speakers on the platform and numerous Jewish activists in the audience. The reason why people get fed up with your interventions is nothing to do with your religion or ethnic origin. It is because you are a pain. Why can't you take part in a debate about the real issues - the siege of Gaza and the slow genocide of its people - instead of throwing around ill-founded accusations of racism? Jonathan says that it is physically impossible to listen as well as speak when one is when one is shouting. Well it depends on how hard you are shouting. The point is that it was impossible to hear virtually anything of the heckling, certainly nothing discernibly anti-Semitic. I've now listened to it again and you only started shouting after 4:20, whereas a poster on HP says it was from 4:10-4:13, so this really won't wash. In any event, even if you were shouting, if a clear and loud shout of 'Jew' or somesuch was made, then I dispute you wouldn't have heard it, especially as it was apparently prolonged. I'm not sure that Alec isn't writing in jest. Do I oppose Atzmon, since I say I oppose anti-Semitism, or not? This blog was formed specifically to tackled Atzmon and have him removed from access to the world-wide Indymedia and in particular IM-UK. In this we eventually succeed. On a poignant note, someone who I had often clashed with on Zionism but who I met in his latter years in joint anti-racist work, Steve Cohen of the Jewish Socialists Group, joined me and Lenni Brenner in dealing with this vile man. Likewise I was responsible for moving 3 years ago a motion calling for there to be no links with Atzmon, or his holocaust denier friend Paul Eisen, at PSC AGM. The Socialist Action faction there opposed the resolution, though they did make it clear in a separate statement that him and Deir yassin would not be playing any part in PSC. Indeed at the height of our campaign against Atzmon, a Zionist activist, who I'm sure Jonathan Hoffman knows and is aware of, one Michael Ezra, was busy acting as Atzmon's private detective in the latter's attempt to discredit me. He found out I had been convicted for shoplifting, which presumably put the seal of kashrut on Atzmon! No you can google my name and Atzmon and you will see that I have consistently opposed him, as have all people in Jews for Boycotting Israeli Goods and similar groups. We, i.e. Jews Against Zionism held a picket in 2005 outside Bookmarks when the SWP decided in a fit of opportunism to host a meeting by him. They have since recanted. "I see that Hoffman, like the Board of Deputies, finds himself such an embarrassment that he is now going anonymous!" Er... why do you think it says 'JH' at the bottom of all my posts?? I see, so people are expected to know who and what you are simply by the initials JH. And there's you making out that the mention of the not essentially Jewish name Hoffman led to anti-Jewish outpourings at meeting where no other self-identified Jews got jeered. You've just exposed yourself as a liar yet again, JH. Trebles all round and you'd better get one for yourself!!! Now, now gentlemen. I'm sure there are more substantive issues, although putting one's name in the box makes it more obvious who is posting than initials at the end. The real question to me is whether Jonathan Hoffman is capable and able of admitting he got it wrong? It is clear that there was no chanting of anything anti-Semitic. This was a false hare as it were, set running by a young Tory hack. I'd be more interested in how Jonathan Hoffman defends the attacks on non-violent resisters at Bi'ilin, the presence of an open racist indeed fascist as Israel's foreign minister, the practice of the JNF to sell or lease land to only Jews, the Judaisation of the Negev and Galilee and of course Jerusalem etc. In fact I'd be happy to debate him on the question of whether or not Zionism is racist! I was one of the several dozen Jews in the hall at SOAS where JH made his usual attempt to derail discussion of Israel's crimes against the Palestinians. I have listened to the recording many times and paid particular attention to the deep voice, belonging to a Jewish friend of mine, that is audible at the time of the alleged heinous offence. Nobody said the word Jew or Jewish at all. Hoffman asked "why do you interrupt me?" and my friend said "Do you really want to know?". That's it. Whether JH believes the auditory hallucination which the BBC has obligingly put into circulation after being fed it by Raheem Kassam, who has his own obscure agenda, only Jonathan himself can say. There wasn't any "anti-semitic chanting", no anti-semitic anything, just a lot of annoyance at a person well known as a apologist for war crimes. For heaven's sake, he was allowed into the hall, allowed to make his spoiling intervention and allowed to leave unmolested. Anti-zionists trying to intervene at Zionist meetings are rarely so fortunate. I don't see how he can own up to getting it wrong since he's getting it wrong deliberately. Also, a debate on whether or not zionism is a form of racism would be worthwhile but since the zios are trying to get it made illegal to say that zionism is a form of racism I don't see how he can accept the challenge on that one either. Perhaps he will debate over whether or not it should be legal or illegal to say that zionism is a form of racism. I'd actually like to debate him on the legality of the west bank settlements. Or on his claim that it is an “untruth that the settlements are illegal”. Actually, I am kind of curious about his reliance on Eugene Rostow, and his claim that the US hasn’t considered them illegal since his time. By the way, this was a good article on the anatomy of a bogus claim of anti-semitism, and how it got planted in the press. Also, that was good point Levi. Has the Community Security Trust recorded Hoffman's "ordeal" as an antisemitic incident? Mark, that is exactly the point I was wondering about. Actually they will probably site the Data Protection Act if you inquire, but Mark Gardner has already stated that it is a disgusting attack on an innocent Jew, so he must file it. And that proves that their stats. are bogus and subjective!!! But I might write to Mark Gardener, though I suspect given the size of his salary that he will find writing back too expensive!! I wouldn't debate Hoffman on the legality of the settlements, because as a Marxist I hold that legality comes from power. They have the power, therefore in their terms it is legal. Just as war crimes are not war crimes when committed by allies. Hence the attack on Goldstone without once dealing with its substance. If that was Iran of course, Obama and co. would be first unto the breach. And international law is even more vague because there is no neutral enforcement mechanism. Nuremburg only occurred because the allies won, but the idea that an aggressive war was a crime against humanity has never got beyond Nuremburg, for obvious reasons. Glad you liked the article. It took some time to write as I had to collate bits and pieces from all over, but I thought it would be good for future reference if it was all put together rather than just developing bit by bit. In addition I went back to the Jewish Chronicle to see their time line and how this developed. Doing it this way it was obvious that JH didn't himself realise he'd been a victim of anti-Semitism until over 2 weeks later. I suspect the victims of Kishinev and Odessa pogroms must have wished they had been victims like Jonathan!